Additive manufacturing, which was first invented in France and then applied in the United States, is now 33 years old and represents a market of around 5 billion euros per year, with annual growth of between 20 and 30%. Today, additive manufacturing is experiencing a great amount of innovation in its processes, software, engineering and materials used. Its strength as a process has more recently allowed for the exploration of new niches, ranging from applications at nanometer and decameter scales, to others in mechanics and health. As a result, the limitations of the process have also begun to emerge, which include the quality of the tools, their cost of manufacture, the multi-material aspects, functionalities and surface conditions. 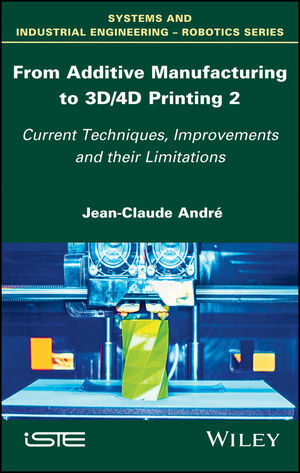 Volume 2 of this series presents the current techniques, improvements and limits of additive manufacturing, providing an up-to-date review of this process. 1. Incremental Developments of Processes, Machines and Materials. Part 3. How Should We Go That One Step Further? 4. A Short Reflection on Spheres to Explore Their Conditions for Achieving Success. 5. Questions of Hope and “Unhope”.